Cross Street has always been a town road starting on Front Street and ending on Third Street. Several years ago, Robert Poirier, who owned the house on top of the hill on the right side, went to see the Selectmen requesting to close the upper half of it as a street, and Mr. Poirier would turn it into a walking path. Mr. Poirier told the Selectmen that, in the winter months, cars coming up the hill into Third Street would not stop at the intersection on top of the hill because, if they did, they would become stuck. This caused a dangerous traffic situation. The Selectmen proposed a Warrant Article at Town Meeting to close the road, and it passed. Although the Town of Rollinsford still owns the land, Mr. Poirier turned the upper half of Cross Street into a bricked walking path with quite a large surrounding garden space. 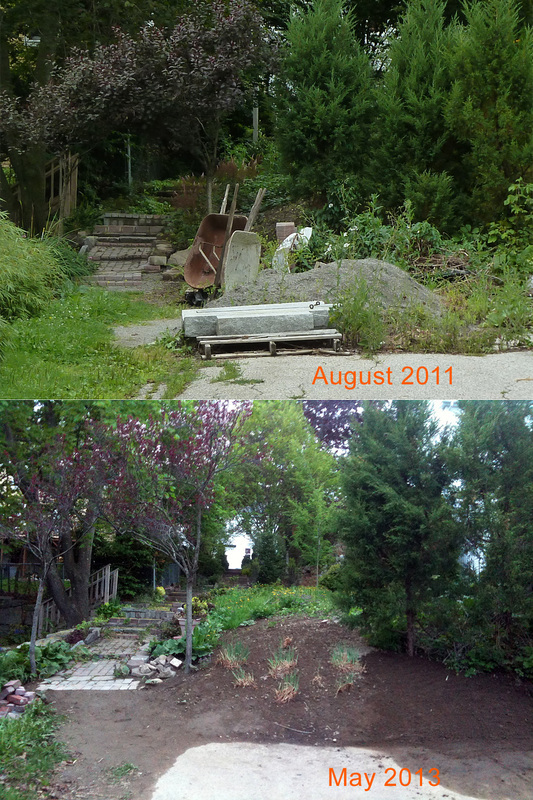 Sadly, when Mr. Poirier passed away in 2011, the path and surrounding gardens became run down. Soon after, several local residents began working independently to do a lot of weeding of the site. The town came in and hauled away a lot of trash and unused building materials that had been collected over the years. In the summer of 2012, the RGLSC coordinated a cleanup day when we weeded the entire site, laid some mulch on the upper half, and cut down one tree at the bottom to allow one resident to have access to the back of their property with heavy machinery. This unexpectedly ended up opening up the base of the garden to a lot more light and has improved the site for the assortment of shrubs and bushes planted along the path and fence. In the spring of 2013, we did the usual general weeding/cleanup necessary and many needed repairs. Then we tweaked and tweaked even more in preparation for the (hopefully) first annual "Growing Green Garden Tour." The site was a self-guided tour, and we received a lot of positive feedback about it, especially from people who had no idea that it even existed! In 2014, we'll be adding signs at the top and bottom of the garden, and we're looking forward to hopefully mulching most of the site to keep future weeding and cleanup to a minimum. We'll gladly take donations from any local landscaping businesses that would like to donate a truckload or two of mulch! In the future, if you would like to help with keeping up the Cross Street Garden for the benefit of the community, either by volunteering or donating for materials, please email us via the "Contact Us" button on the left!